It consists of a driven piston and a label-pick up pad by way of a vacuum generator and a sensor, which detects the actual pick-up of the label. The system is “self-adapting” which means that the pad searches for the object and until it has gone into pressure over it, the piston is not commanded to return. • SHORT for a useful stroke of 300 mm. • LONG for a useful stroke of 600 mm. • EXTRA-LONG for a useful stroke of up to 1,250 mm. It consists of a driven piston and a label-pick up pad by way of a vacuum generator and a sensor, which detects the actual pick-up of the label. The system is “self-adapting” which means that the pad searches for the object and until it has gone into pressure over it, the piston is not commanded to return. ROTOR SHORT with 530 mm arm. ROTOR LONG with 800 mm arm. Tamp blow applicator. It consists of a driven piston and a label-pick up pad by way of a vacuum generator and a sensor, which detects the actual pick-up of the label. The application occurs without contact with the object, by way of a powerful blow of air. “Static air blow” applicator without moving parts. The air-blow pad is fixed (no movement from the piston). It is a high efficiency pad able to “shoot” the label precisely at a distance of up to 60 mm from its surface and so up to a distance of 30 mm from the labelling machine. It is suited to high rate applications on moving objects (also at high speed). In the case of surfaces with difficult adhesion it is recommended to use the finishing device of the application. It consists of a soft rubber roll that presses the label when it passes (after labelling). It is suited to applying micro-labels with high precision on a stationary object and flat surface. The ”3-sides” applicator consists of a linear piston with a max. stroke of 500 mm and a second piston with a max. stroke of 150 mm mounted onto a rotating head. Label dimensions: A5 format (H 150 mm x B 210 mm). • Detect the pallet has been reached by the applicator. • Hook up the strap or wire and bring them close to the pad. • Fold the label onto the strap or wire. • Release the strap or wire with the label applied. Linear movement applicator. It consists of a driven piston and a pad to pick-up the label by way of a vacuum generator and a sensor that detects the actual pick-up. Its elastic broad deforming structure makes it possible to label objects, also with very different diameters. This pad is of the “wrapping” kind able to label round objects. Its elastic broad deforming structure makes it possible to label objects, also with very different diameters. Linear movement applicator. It consists of a driven piston and a pad to pick-up the label by way of a vacuum generator and a sensor that detects the actual pick-up. This pad also includes a second piston that carries a soft rubber roll that folds the label by 90°, and gives it a corner shape. Linear movement applicator. It is suited to applying small labels inside pipes or spools. The applicator consists of a driven piston with a max. stroke of 350 mm and a label-pick up pad by way of vacuum generation and a sensor that detects the actual pick-up. A special mechanism, controlled by a micro-cylinder, allows the micro-label to be picked up after it has been printed and to be applied precisely onto the object to be labelled. It is a simple and cheap applicator that is able to dispense labels onto moving objects at the same speed as that at which it overprints them. In order to do so, it exploits the special high-speed thermal-transfer printing capacities of the Printess printers (up to 450 mm/sec). to apply one label at the corner of moving boxes. 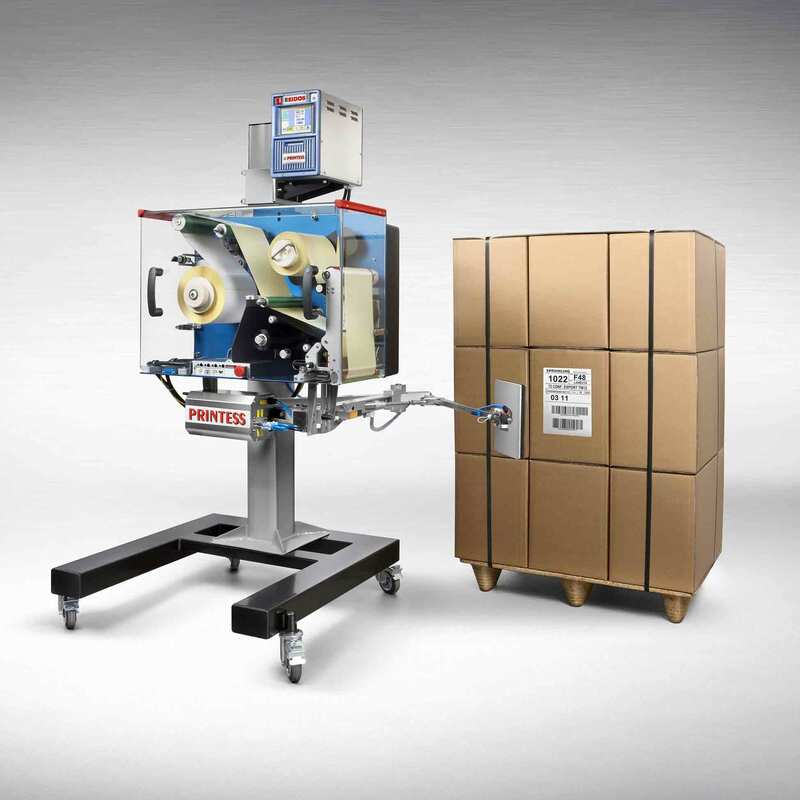 Specific solution for the application of front labels on boxes and bundles moving at a high frequency. Suited to label application with reduced and variable spaces between boxes. Real time updating and marking of variable data. The change of text occurs without having to remove the labels of the buffer. The new Printess machines are set up to encode “smart labels” (tags). After it is printed, the label is brought onto the applicator pad and then coded in radio frequency. The label is read for verification purposes and, in the case of error, rejected (by means of an incorporated rejection device). The label is then applied automatically onto the object (pallet) and checked a second time. The code conforms to the most recent standards for UHF tags (EPC Global Class1 Gen2). Upon request it is possible to operate at lower frequency (HF at 13,56 Mhz).